Dear Mummy, while we were visiting my Grandparents in Northern Ireland we took a jaunt down the M1 & A1 towards the Northern Ireland border with the Republic of Ireland in South Armagh. We were heading to Slieve Gullion Forest Park, an hours drive outside Belfast. It’s near Newry in South Armagh and is part of the Ring of Gullion. 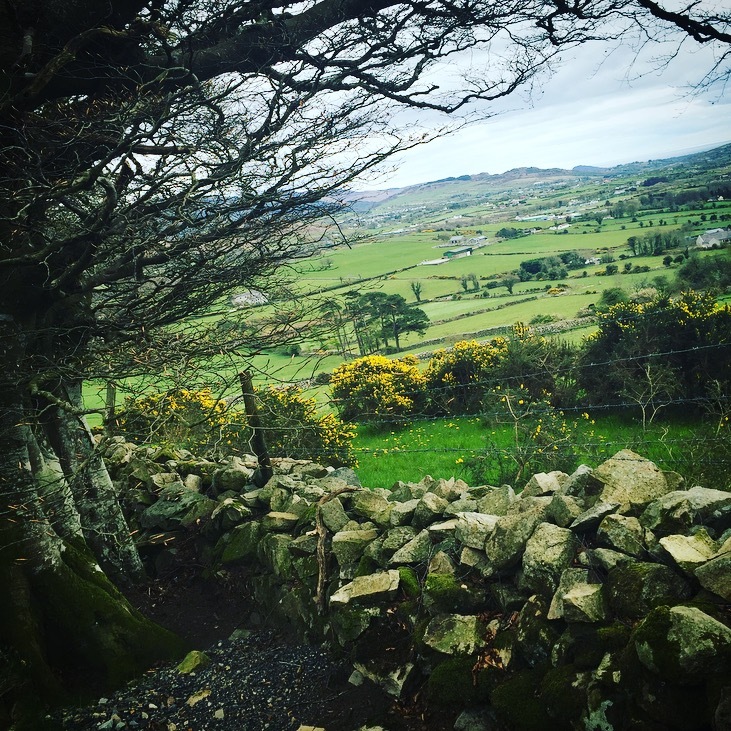 We’d heard that The Ring of Gullion was an area of outstanding natural beauty and we weren’t disappointed. The ring of low, rugged hills forms a ‘rampart’ around the heather-clad Slieve Gullion mountain and we’d been meaning to visit this area of countryside for some time. Its rich semi-wild habitats of heath, bog and woodland contrast with the neatly patterned fields and ladder farms it was a photographers dream. It’s so beautiful. We drove up narrow roads until we reached our destination Slieve Gullion Forest Park. It was clearly signposted so we didn’t get too lost! Its been said of South Armagh that you can ‘kick any stone’ and it will tell a story….and we’re eager to make a story up of our own. We definitely had a lot of fun and made some wonderful memories. However, instead of trekking up the Mountains of Mourne or going on a scenic drive we visited Slieve Gullion Forest Park. It’s full of tranquil woodland trails (long and short), stunning views across the Ring of Gullion, Mourne Mountains, Cooley Peninsula and Armagh Drumlins and top class facilities for walkers and families. Perfect for my little legs – I don’t think I’m quiet ready to trek up a mountain just yet!! 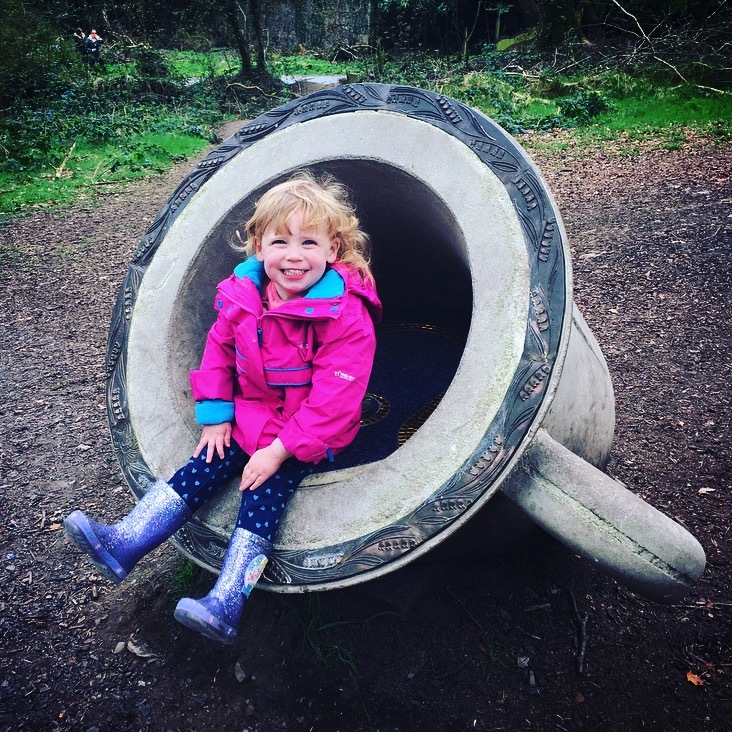 Before out adventure began I played in the Slieve Gullion Adventure Playpark. 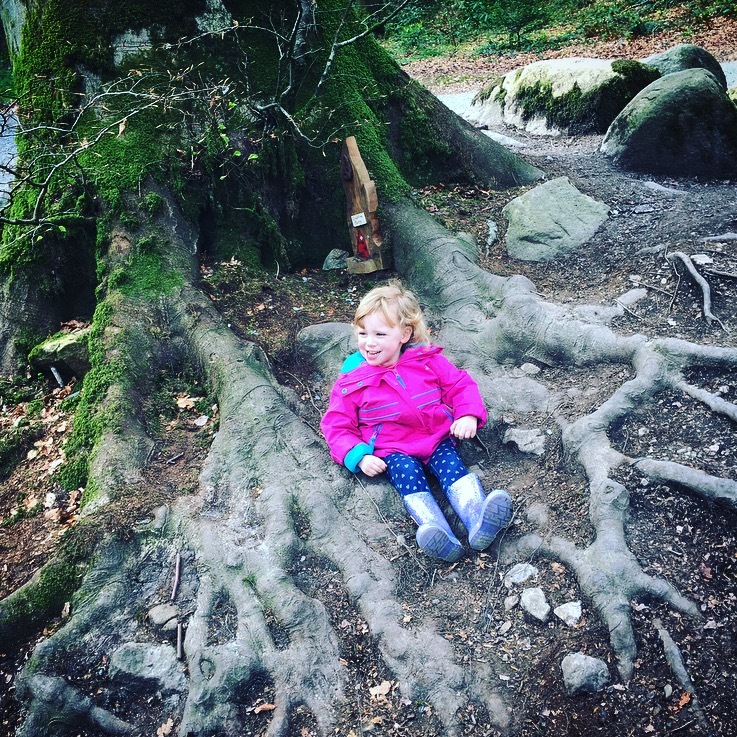 Its set in the beautiful grounds of Slieve Gullion Forest Park and was the perfect start to our family trip into the forest. It was the first thing we saw after leaving the car and a must visit for everyone (including my folks) with award-winning play facilities for children and young people. There were plenty of places for the adults to sit while the kids played, but the structures looked like too much fun so my folks got stuck in as well! It wasn’t overly busy and was set on different tiers up the side of the hill. The wooden structures were sympathetic to their surroundings, tidy and safe. It was great to stretch my legs and have a good giggle in the playpark while my folks studied the maps dotted around on boards trying to get their bearings. It kept me thoroughly entertained and I had to be dragged away with the promise of fairies in the woods! 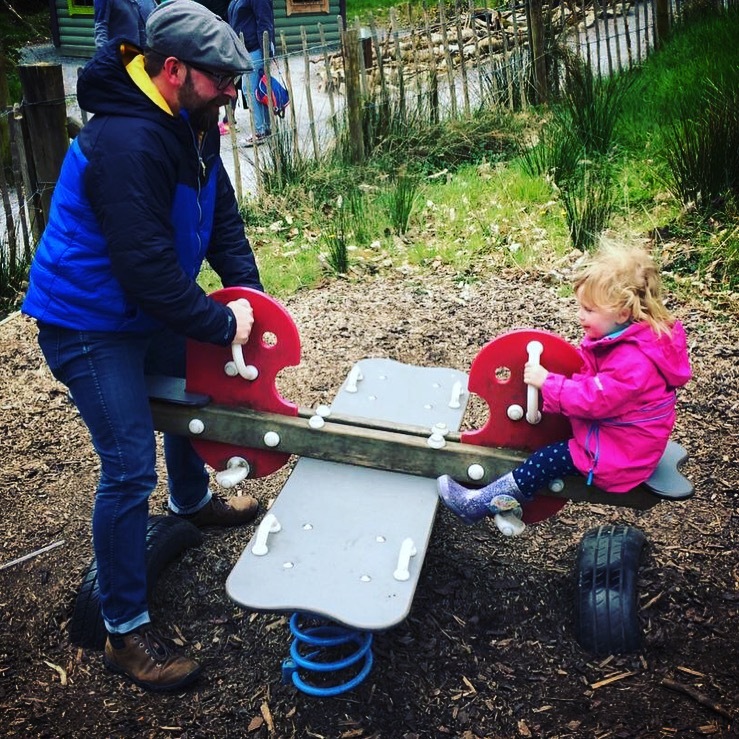 It included a specially designed toddler’s area and play equipment for the older kids, I even had a go on the “Slieve Gullion ZIP” while my mummy dodged the trim trail for the adults. My mummy was really impressed with the play park and I could have stayed there all day! It was in a great location near the car park and gave children the opportunity to burn off some energy before heading home. But we had just started our adventure! Slieve Gullion Courtyard was just around the corner so we picked up some water for our trip at the little shop, picked up a map at the visitors centre and headed into the woods. 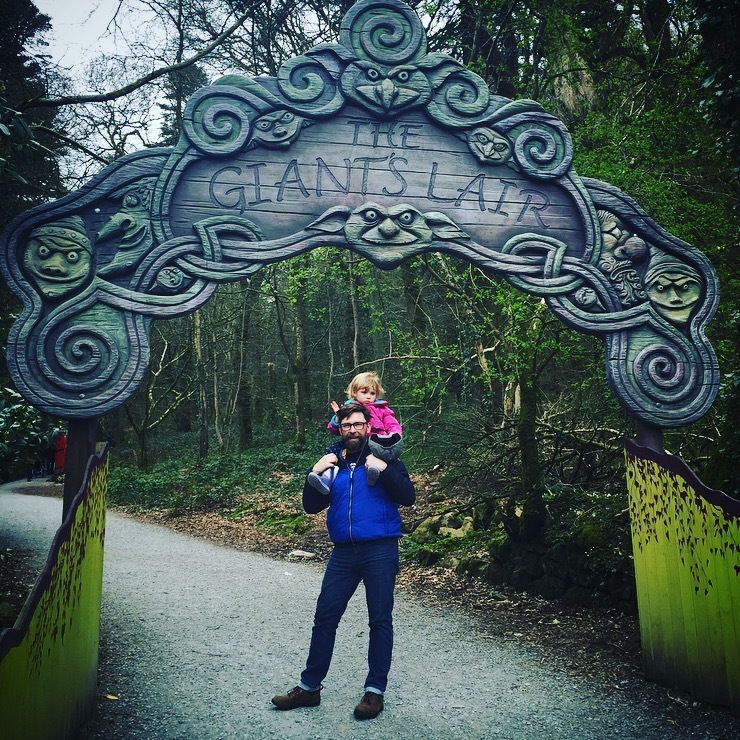 The Giant’s Lair trail took us on a journey of magic and is situated beside the Slieve Gullion Adventure Playpark. With its impressive gateway we couldn’t wait to explore. We visited on a dry day, however it had been raining the previous day, so we had our walking boots on. The pathways were even and it didn’t seem muddy, they were wide and perfect for walking side by side with family members. 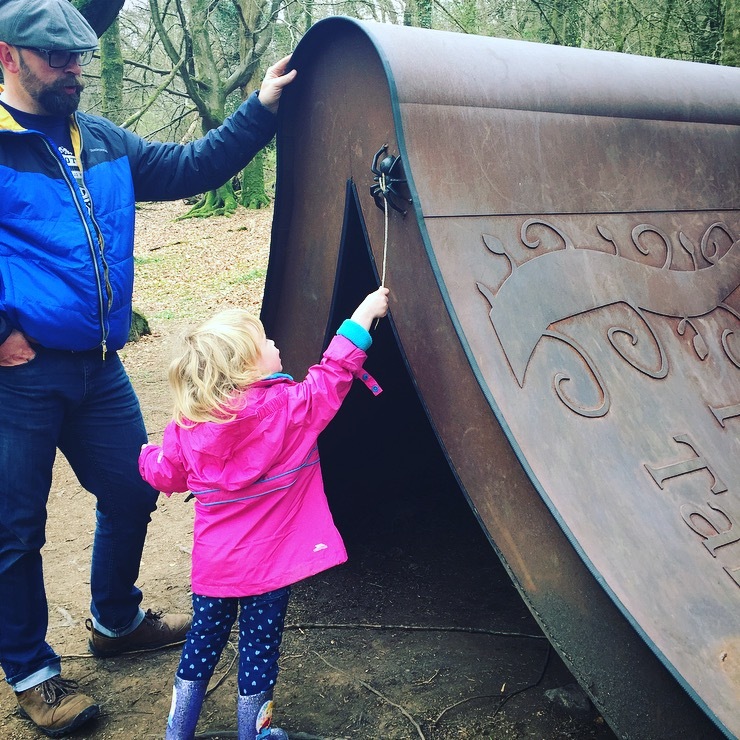 The trail is free to walk around and it leads you to plenty of attractions within nooks and crannies off the pathway, which are signposted or clearly evident by brightly coloured doors and sculptures. 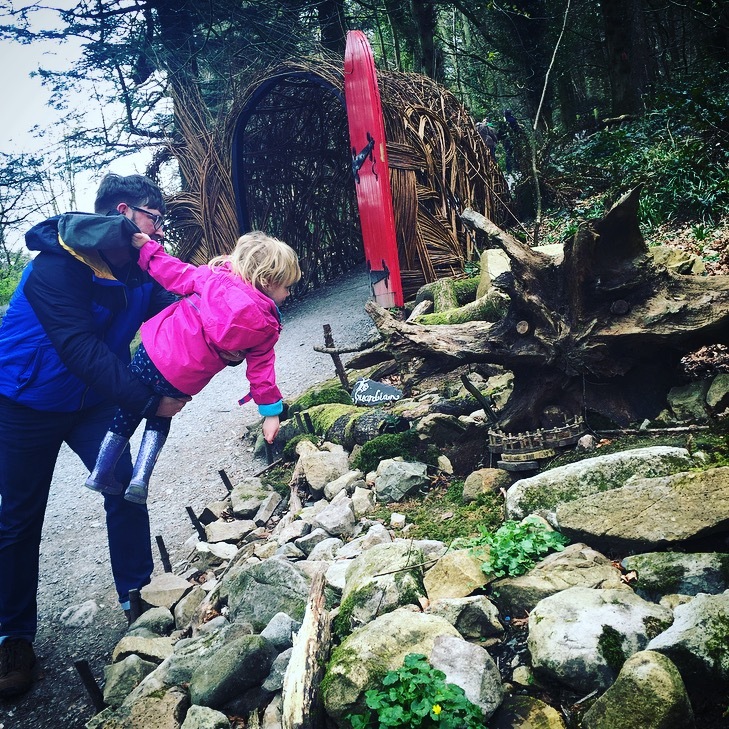 We’d recommend baby wearing with a small tot, however the paths are great for buggies too, but it can get a bit steep in places so just bear that in mind! We got lots of exercise and I definitely did my steps for the day! We’d read that it was the most ambitious children’s arts project commissioned in Northern Ireland and we can see why – it was full of artwork and sculptures. The sculptures were well looked after, clean and substantial and their was no litter around and the paths were well maintained. Each time we spotted something we would inspect it for a couple of minutes which was a great way to rest little legs and enjoy the walking more. It was almost like a treasure hunt, visiting for the very first time, as we didn’t know what was coming up after every bend. We were all very excited! 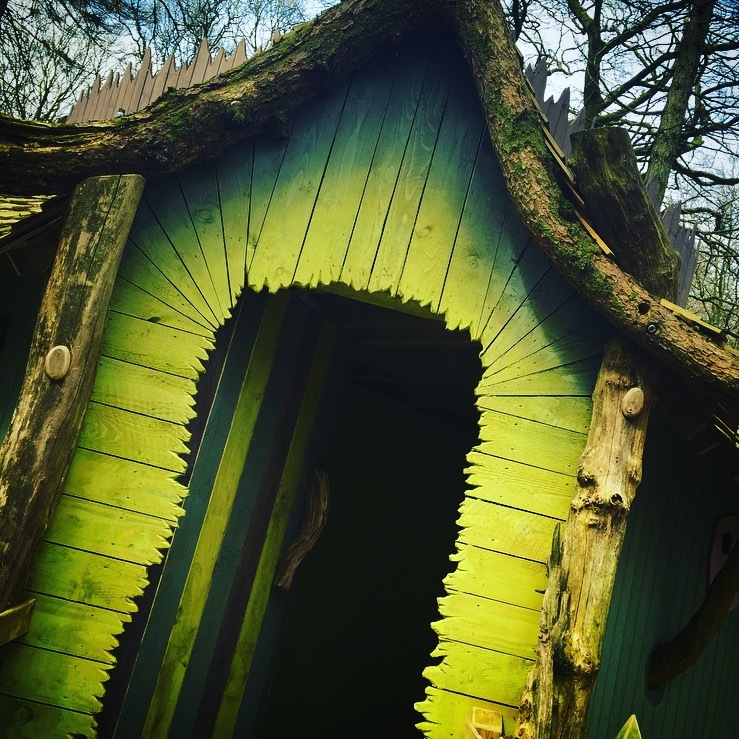 The Giant’s Lair Story Trail takes visitors on an unforgettable journey of intertwined fairy house and arts features creating a fantastical childhood land of mystery, dragons, giants, witches and fairies. We spotted this giant story book on the trail and I was fascinated by the spider that sat on it. (It was very realistic!) We played hide and seek and told stories while walking on the trail and I got very involved peering through windows and doors. 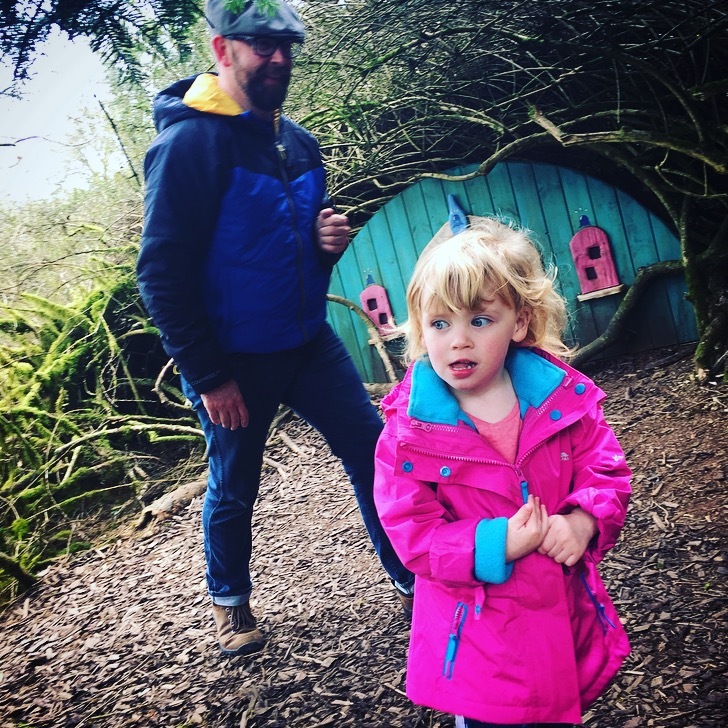 Daddy would sometimes pretend to be the hobbit or fairy in the house which got me even more involved. The art in the Giant’s Lair was all inspired by the rich tapestry of local legend and mythical folklore the attention to details was spectacular and one of the nicest fairy walks we’ve ever been on. It wasn’t busy when we ventured into the woods and felt like we had the whole place to ourselves. We walked for over a mile and it was fun and effortless. 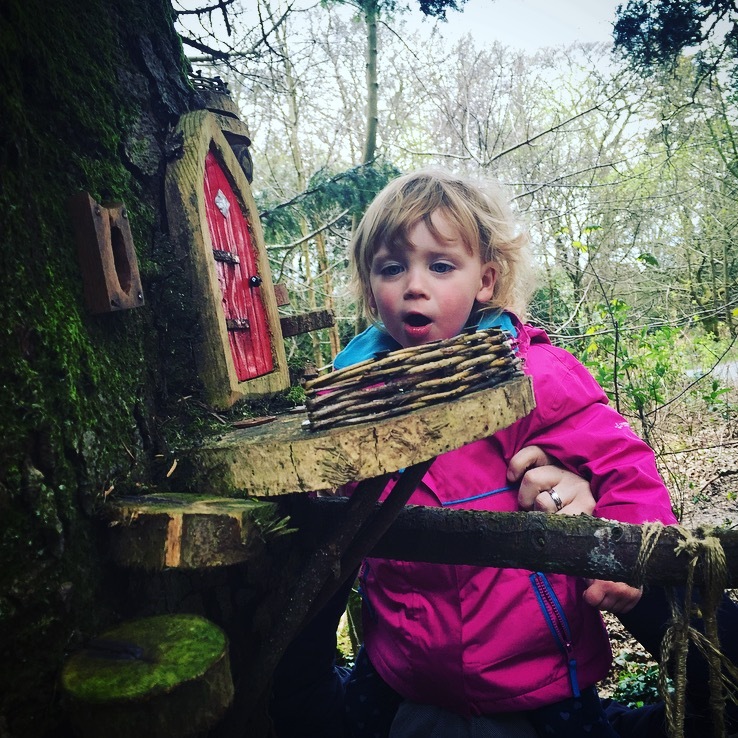 My mummy loved watching the awe and wonderment spread across my face when I discovered another fairy door hidden in a tree. We visited the tooth fairy and numerous other fairies dotted around the trail. 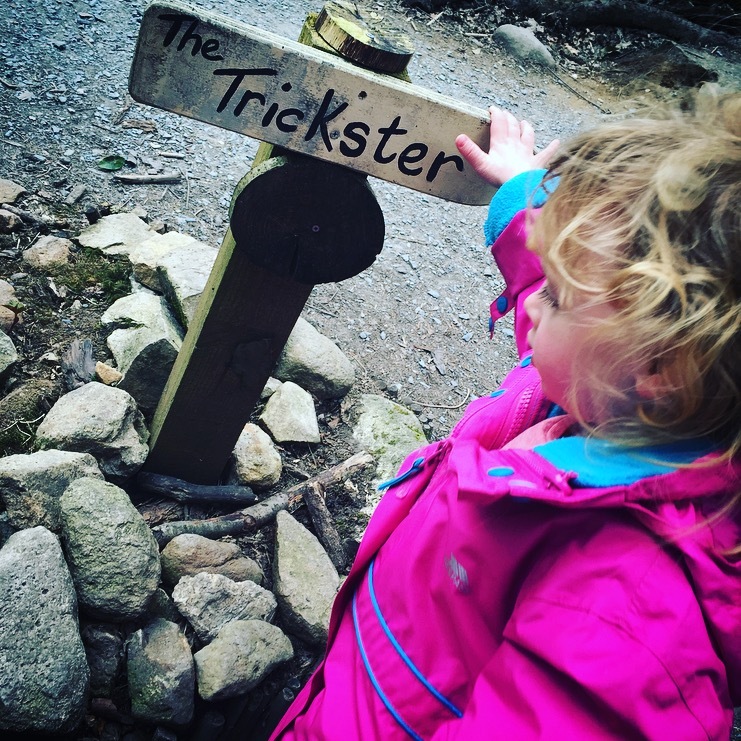 We followed in the footsteps of Flynn the mischievous fairy, who has one important job – not to allow anyone to wake Slieve Gullion. It might look like a mountain but it’s really a sleeping giant! Half way round the trail another wonderful children play area appeared amongst the woods -it was a massive treehouse/fort and beautiful decorated, only then did we see other people walking the trail. My folks were gobsmacked by how lovely this area looked – really magical and would rival Efteling or a Disney theme park scene. Every tree on the pathway was enthralling, even the ones that didn’t have fairy doors hidden in their trunks. Branches were creepy and old and there was a real magical atmosphere walking around. 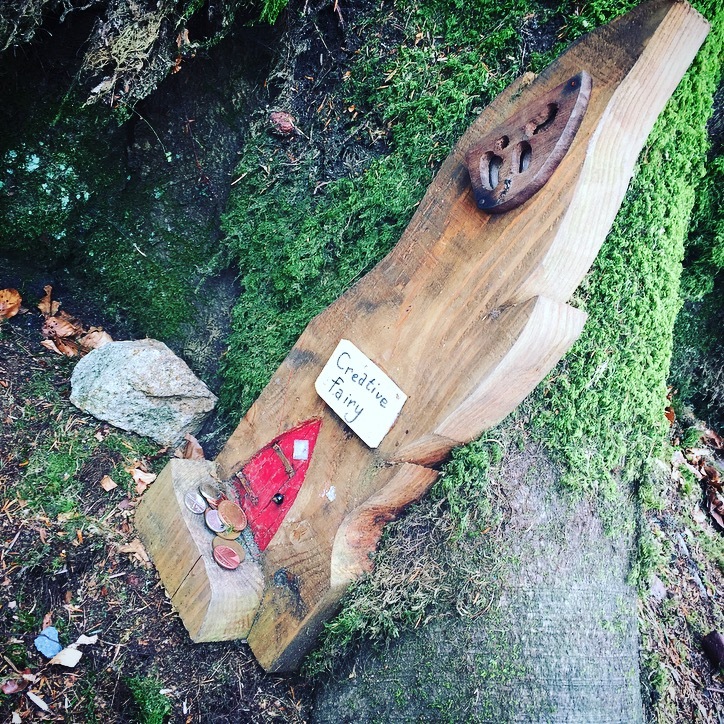 At some of the fairy doors, visitors had left tuppence to them, for wishes and tolls. The coins which were given to the fairies were regularily collected by staff and donated to charity which we thought was a nice gesture. We made lots of wishes and saw where the fairies lived and had a wonderful day. 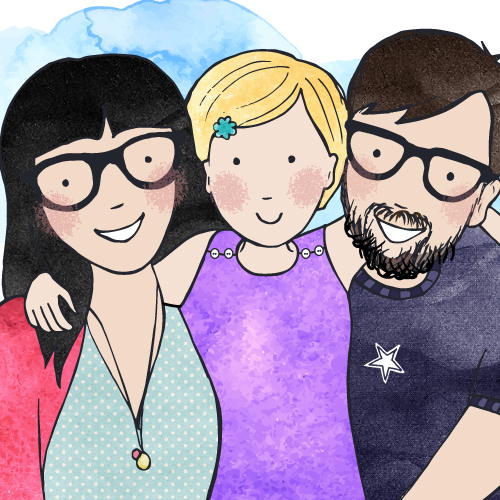 My mummy paid homage to the ‘Creative Fairy’ and knocked on her door. She needs all the help she can get in her line of work (She’s a graphic designer) Afterwards we headed back to courtyard and had a lovely late lunch at Synge & Byrne which topped off our visit perfectly. If you are ever in Northern Ireland we’d definitely recommend this place! Absolutely amazing….and FREE. 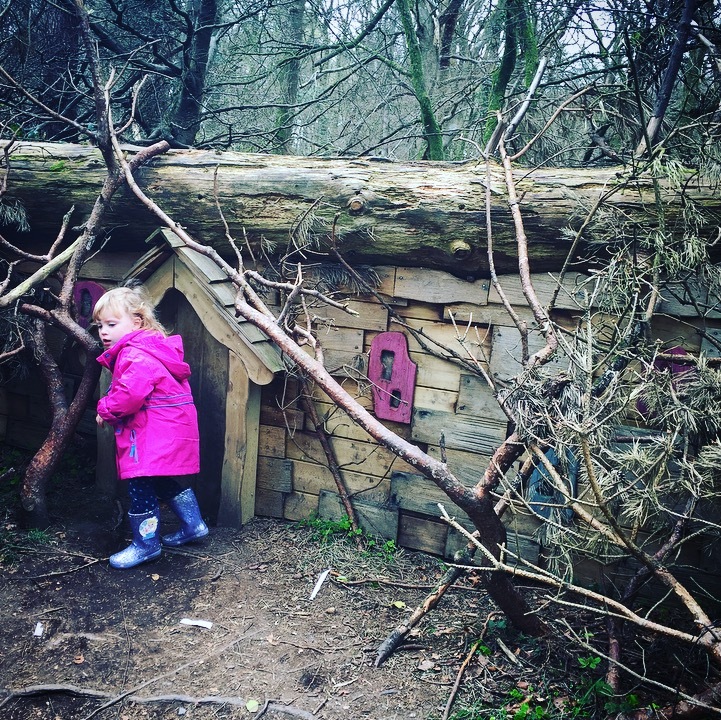 A perfect destination to fuel little ones imaginations and we can’t wait to go back! 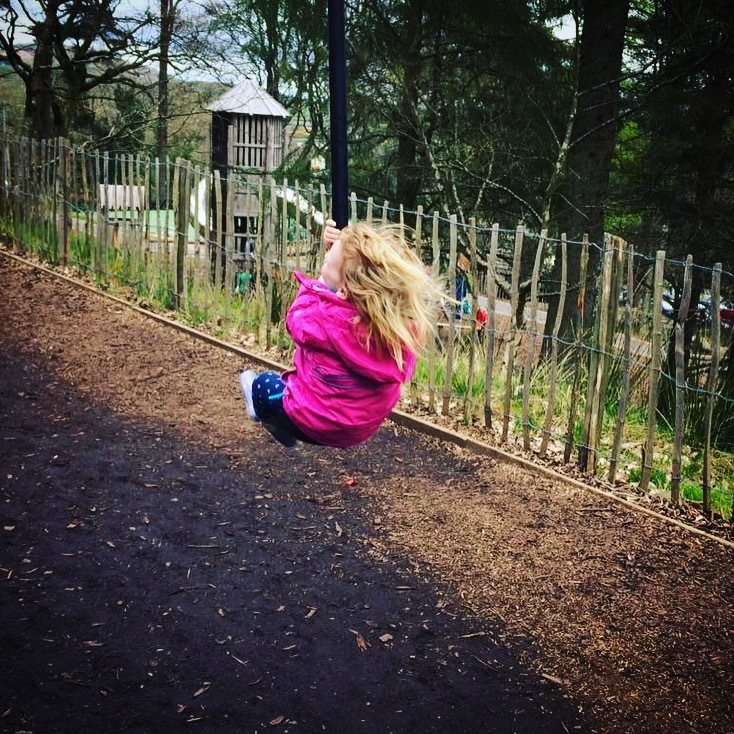 Slieve Gullion Forest Park was awarded the Green Flag in 2014 and awarded 4 stars in Tourism Northern Ireland’s prestigious Visitor Experience Star Ratings in the same year. The Playpark has also attained the ‘Green Apple Environment Award’ and ‘NITB Best Tourism Partner Initiative Award’. 1st April to the last weekend in October – 8am until dusk. 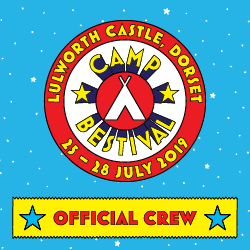 Last weekend in October to 31st March – 8am until dusk. Well worth a visit…we couldn’t believe it was free!! Your photos look like something out of a fairytale! Such a stunning place – i’d love to visit! This is so pretty, I didn’t know such a park existed in Ireland. I would enjoy walking around and discovering fairies, so I don’t think it’s only for children. 🙂 I think there is a similar forest somewhere in the UK, but with less attractions. What an amazing place for kids. I love how your mummy left an offering to the creative fairy too! That place looks totally magical, just so much fun. I knew that Northern Island was beautiful as I have friends that hail from there but this is something else. Like a fairytale! It was amazing! Completely out of the blue as well, like a hidden world! What a magical place. Would love to visit with the kids. Amazing day out! Looks like so much fun! Places like this are totally magical! There’s a Woodland Fairy Experience near us and it’s very similar. Wonderful days out! 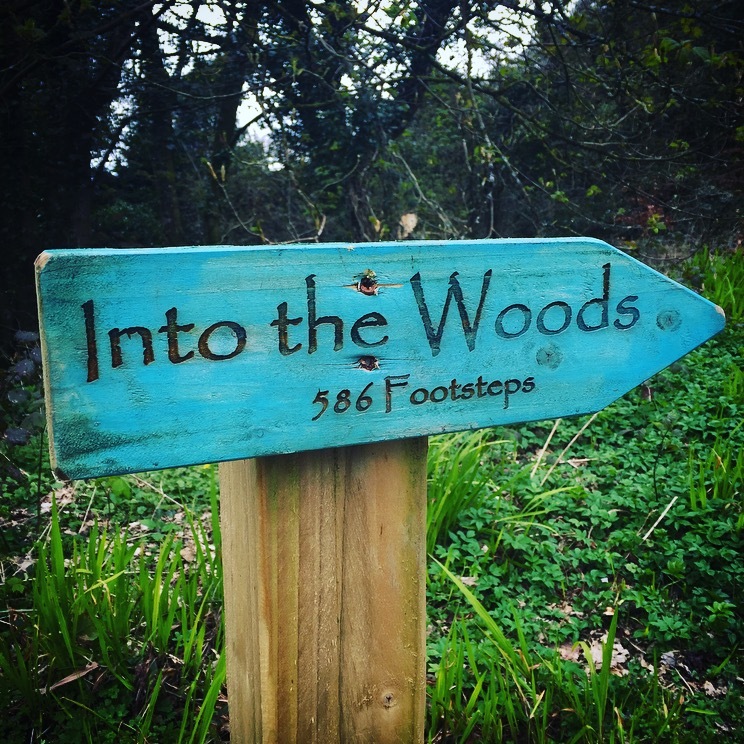 What a magical place – I’d like to meet that creative fairy too! This place looks like such a fun family day out I hops to go to Ireland one day. What a lovely place to visit, it looks so enchanted. Wow what a magical place! It looks like a great day out, wish it was closer to me! Oh this is so cool! This seems like such a magical place. That fairy tale atmosphere is unique! What an amazing trip! I’ve been to Belfast once on a daytrip for a meeting so wasn’t anywhere near exciting as this! Can’t wait to visit Dublin in September though! What a fun place to go for a walk with kids. I bet they love it! This looks like such a cute place to visit! I’m glad you had fun! The ‘Into The Woods’ sign made me think of the musical! 🙂 Looks like a fun walk. beautiful pictures, I literally want to visit here, it looks amazing.